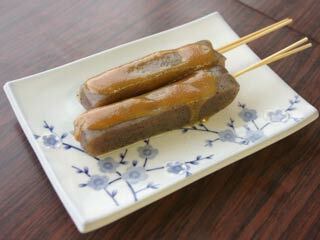 Misodengaku (味噌田楽) is one of the way of cooking with Miso. Miso covered food could be any things such as Tofu, Konnyaku, Eggplants, or Potato. Those food are stabbed by bamboo stick, just like Yakitori. Konnyaku is the most common type of Misodengaku. Add little salt on Konnyaku and crumple it. The salt will scratch the surface of Konnyaku. Slice Konnyaku to stick shape and stab the bamboo sticks. Put Konnyaku into water and boil them from water. 3 more minutes after water start boiling. Add 5 large table spoons of Miso. Add 5 large table spoons of Sake. Add 5 large table spoons of Sugar. Cook them small fire for 5 min.